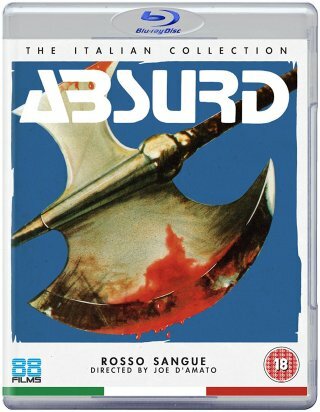 Joe D’Amato’s Absurd (OT: Rosso Sangue) was made in 1981 and exists in two versions internationally. Apart from the original cut, there’s also an extended version that is about 8 minutes longer (see comparison). In May 2016, 88 Films announced the start of a crowdfunding campaign in order to produce a new 2K mastering. The goal was reached quickly and collected so much money that four other films could be restored, as well. One of them is Man Eater (1980) which is also getting a new release in the future. The BBFC rated Absurd with the BBFC 18 classification with no cuts necessary. That’s the first time for the film in the UK. Previously, it was censored with that rating. The new Blu-ray has its street date on February 13th, 2017.